The Premier League is watched by millions of football fans around the world, with clubs competing on all fronts in order to attract more fans. They’re no longer content to just having the best players on the pitch; they want to be bigger and better than the rest in every way possible. This includes the overall fan experience and pre-match entertainment before the game, and Pyro Special Effects certainly meet the brief. One of the biggest challenges at Stamford Bridge (a stadium built in 1876) is the close proximity of the seating to the pitch. The configuration of the stadium provides very little room to position equipment and hampers quick movement into and out of position. When working pitch-side, our solution is to use the small and compact G-Flame – a wireless system with self-contained power (allowing for usage without any time delay dealing with tricky cables). Entertainment Effects have also designed and built compact trolleys which can carry up to four flames each, enabling us to wheel the units seamlessly off the pitch in around 60 seconds. The initial intention from Chelsea’s marketing team was to save our special effects for special occasions, but with Chelsea’s recent rich vein of form we’ve been regulars in West London, helping to celebrate two Premier League crowns and three Youth FA Cup victories. Following the success of the pitch-side flame effects, Chelsea challenged us to produce something even bigger and better! Due to space constraints, we suggested moving the roof. This eliminates the space issue and enables us to fire much larger pyrotechnics to create a huge aerial display. The key to rooftop display timing is to ensure that it’s dark when the show is fired, so that the products deliver maximum visibility. It’s easy to check sunset times online and our team always allow an extra half an hour to ensure that the light is at the optimum level. We looked at the upcoming fixtures and noticed that Chelsea had an evening kick-off on Bonfire Night weekend. Everyone agreed that this was the perfect opportunity to celebrate Guy Fawkes with some Fireworks. Products were fired vertically as well as horizontally out across the pitch, to the huge cheers of the fans as Stamford Bridge shook with excitement. 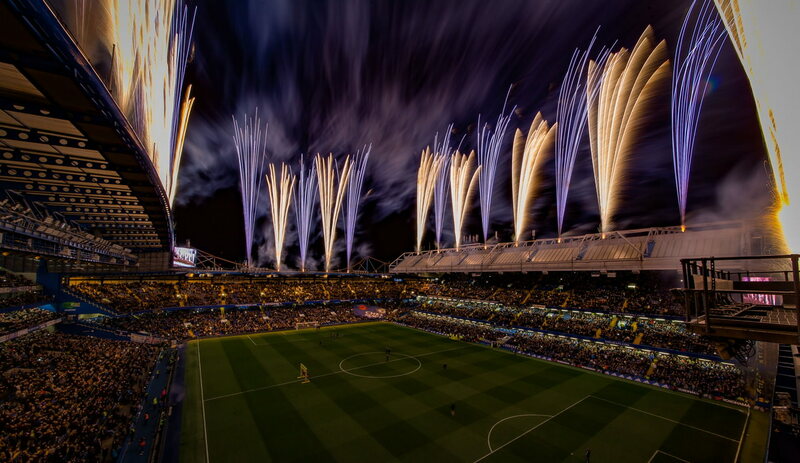 We’ve fired two pre-match pyrotechnic displays at Stamford Bridge, and the results on the roof and the pitch were equally spectacular. Chelsea won 5-0 and 5-1, with five of these goals scored in the first 20 minutes across the two matches. We like to think our special effects and the atmosphere we helped to create contributed toward these impressive wins!